the next three games will be played in the ShoWare Center in Kent, meaning the Thunderbirds now have the opportunity to win their first WHL title on home ice. . . . A year ago, the Thunderbirds lost the WHL final to the Brandon Wheat Kings, 4-1. The first three games all went to OT, with Brandon posting three 3-2 victories. . . . Last night, the Thunderbirds appeared to take control when they struck for three goals in 56 seconds early in the second period to take a 3-1 lead. . . . The Pats took a 1-0 lead just 50 seconds into the game as F Sam Steel (9) took advantage of a Seattle turnover deep in its zone. . . . D Austin Strand (5) pulled the Thunderbirds even at 3:56 of the second period, his shot from just above the left circle getting through traffic and changing directions before beating G Tyler Brown. . . . Just 16 seconds later, D Turner Ottenbreit’s second goal, a slap shot from the point, gave the visitors the lead. . . . Just 40 seconds after that, F Alexander True (9) scored on a rebound while on a PP. . . . 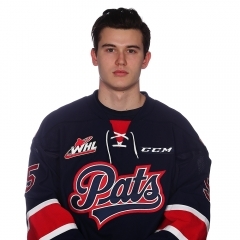 The Pats’ comeback began as Mahura pinched on a 5-on-3 PP and scored from beside the Seattle net at 18:35 of the second period. . . . Regina tied it at 5:20 of the third when F Filip Ahl (5) forced a turnover deep in the Seattle and then scored off it. . . . Seattle F Keegan Kolesar was giving a kneeing minor after he gave the business to Regina D Connor Hobbs following a stoppage at 4:59 of OT. Mahura, who has six goals in the playoffs, scored just 23 seconds later, beating Seattle G Carl Stankowski with a 70-foot snapshot through some traffic. . . . Brown finished with 27 saves, five more than Stankowski. . . . Regina was 2-7 on the PP; Seattle was 1-3. . . . F Dawson Leedahl had two assists for Regina, while Steel and Ahl each had one. . . . Steel, the regular-season scoring champion, now has 27 points in the playoffs, one behind F Reid Gardiner of the Kelowna Rockets, who leads with 28. Steel leads playoff scorers in assists (18). . . . The Thunderbirds got back Kolesar from a one-game suspension. He went into the game leading them in goals (9) and points (22) in these playoffs. . . . Regina scratches: F Adam Brooks, D Dawson Davidson and F Jake Leschyshyn, all with injuries, G Max Paddock, F Duncan Pierce and F Owen Williams. With Brooks out, F Kjell Kjemhus got into the lineup. . . . Seattle’s scratches: G Rylan Toth (injured), F Elijah Brown, F Tyler Carpendale, F Dillon Hamaliuk, D Jake Lee and F Luke Ormsby. . . . Announced attendance: 6,484.Greg Harder of the Regina Leader-Post has a game story right here.Andy Eide of 710 ESPN Seattle has a game story right here.Darren Steinke, the Travellin’ Blogger, posted this piece right here.